There are plenty of android apps which pays you when you use them,but it’s really hard to evaluate which one is really going to pay you and which one is just playing with your emotions 🙂 😉 . Here today I’m going to write about an amazing free android app which is really going to pay you right through your wallet. CashOnAd is a Free mobile application which can be easily found on any of smartphone application market including Google Play Store & Apple App Store for free. CashOnAd is a milestone in the door to door marketing world cause it serves contextual advertisement in video or Image format on your lock screen or on your Incoming call screen. The importing things to remember for you is that you just need to watch those advertisements only for six seconds. And yes after six second you can go for your incoming call or unlocking screen as well. If you watch these ads six seconds a penny will be added on your account and in these way you can add eight penny per day on your account, that’s mean you can’t earn more than $0.8 per day, but you can earn with your regular incoming calls daily. Actually you can earn through your Locked screen and incoming call screen both by watching attractive video or image advertisements. Related Post: Get Paid Whenever you touch your own phone. Generally including your importing phone calls we got 3 times benefits using this application, second one is that you can have relevant and daily life goods info right through your phone for free and lastly you would be paid for watching those information (Ads) daily. And yes you can also be rewarded by extra bonus balance if you would be able to invite your friends to use CashOnAd. Let me note you that you don’t need to invest your any money to use this app or for anything else, but you only have to synchronize your CashOnAd app once in 24 hrs that’s mean you only have to be online once in 24 hours for synchronization of your data. After WhatsApp CashOnAd is also going to be part of Facebook coz rumor is that facebook fixed the deals buying the copyright or ownership of this app. CashOnAd is a ordinary Application which can be used on every Android phones. After installing this app your phone will show you a video advertisement just above your incoming call screen that means just above the name or number of your caller and if you wait for 6 seconds and pick up your phone then you will be rewarded $0.01 on your CashOnAd Account, in this way you can earn $o.8 per day. Finally if you collect total $1.00 on your account they will let redeem earning via your prefered medium including PayPal, eSewa and via Cheque. Publisher:- Shiran Technologies Pvt. Ltd.
After installing the application you have to Sign Up for your CashOnAd account, it also gives you option to sign up using your existing Facebook or Gmail Account. When your account will be ready finally you would be asked to verify your account via E-mail or SMS and you have to choose your payment method among PayPall, eSewa or direct cheque method. Now you are ready to earn money with your incoming calls. 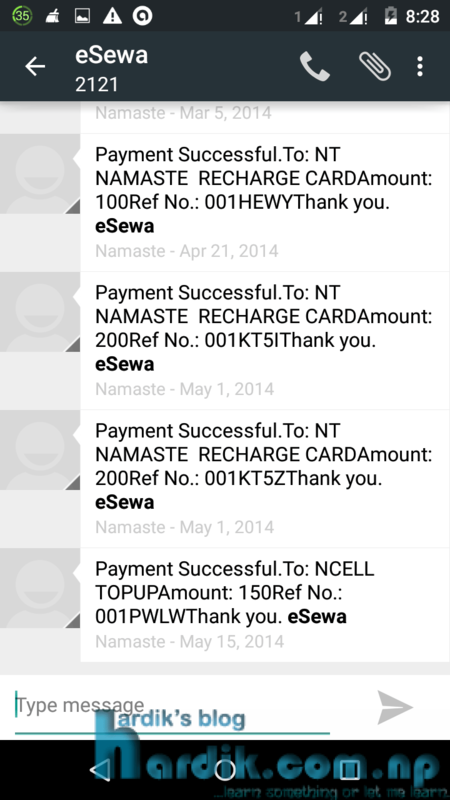 If you do have any doubt about this connection here are some of my own screenshots of messages which will show that they had deposited my earning on my eSewa account and even I have used those earning for testing, and yes I found it that it’s 1000 percent true. For more please visit CashOnAd’s Official Webpage. Don’t be Selfish…………………… Please Share the Post If you Love it. How to Lock/Hide your files and folders. Get paid whenever you touch your android phone. How to Recover Loksewa Aayog Username Password | Recover Screen Name & Password. How To Fill Up Loksewa Aayog Online Application Form? Next Get paid whenever you touch your android phone. i can’t log in why is that?? Dear Yulan please clarify your problem more. Aru you using your FB or Gmail ID for loging? Oh….It is working. Thanx a lot for such a cool idea. Glad that it works on you. Please convey your experience after using it over here. it is really interesting. I will surely install this and let u know my views. Anyway please do convey your experience after using it over here.